A little less than a year ago Wigan Post reporter James Illingworth wrote that eventually we would have the full story of what happened in Wigan in the days following the Manchester Bombing. We have still not reached the stage where we have absolute clarity. With the complex investigation ongoing, it appears we may have to wait a while yet. But what we can say with certainty today – like we could in late May 2017 and many times before that - is that the people of this town rally round their communities when it’s required most. With the passing of time comes perspective. But even with the benefit of hindsight it’s difficult to describe how it felt when the focus of the nation’s counter terrorism force jumped out of TV screens and news print to the doorsteps of Swinley. Like never before issues of national security were being played out just down the road from the Cherry Gardens, a stone’s throw from Wigan Infirmary and a few steps from the Bellingham. It still feels like those things simply don’t belong in the same sentence. With armed police having arrested someone a couple of days before near the town centre, May 25 started with stories emerging of an over-night raid and more people taken into custody. As we reached evening, with the cordon now in place, it wasn’t until the bomb disposal teams rushed past that the potential severity of the situation began to settle. With national news helicopters whirring high above, residents evacuated from their homes were being called over to be informed they may need to organise alternative accommodation for the night. And that’s when the moment that has become my enduring memory from that night occurred. Residents started offering their houses, spare rooms, couches and transport. Our Twitter accounts were repeatedly pinging with notifications. In the end it wasn’t needed. But in this moment Wigan reflected the supportive strength and defiant spirit that the people of Manchester had showed, and continue to show, in the wake of the attack. 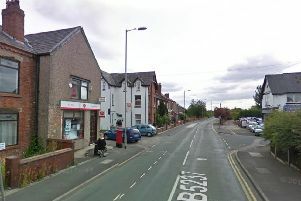 It shouldn’t be forgotten – as it is certainly a detail that will stay with me – that in the midst of all the ‘is there a bomb?’ and ‘will they have to carry out a controlled explosion?’ those gathered on Wigan Lane paused briefly to celebrate a Warriors try up the road in St Helens. And for a moment the pertinent questions were about who was taking on the kicking duties rather than bomb disposal unit strategy. Love of sport – like generosity of spirit – seems to come as part of the identikit of a Wiganer. The cordon was lifted later in the evening – no bombs, no controlled explosions, just mentions of suspicious items – although officers would return in numbers to the same address a few days later. The anniversary gives us time to reflect; on the strength of those affected and the solidarity of a city united. So let’s remember those who gave no second thought to offering help and support, showcasing the best of this town.